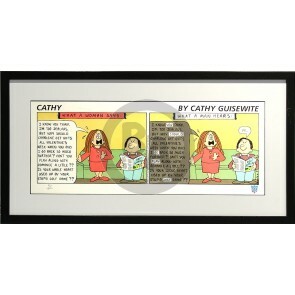 Creator of the syndicated cartoon, "Cathy", which humorously chronicles the ups and downs of a single woman's life, Cathy Guisewite, born in 1950, has created an endearing character whose thoughts, words and actions are humorously paralleled in the lives of millions of people (mostly women) who appreciatively follow her cartoons in over 1600 different newspapers around the world.Cathy Guisewite's immense and sustained success is partly due to the fact that she fashions her comic-strip character's adventures after her own life's experiences, which, in turn, reflect those of the population at large. Thus, Cathy readers can readily relate to "bad hair days, " Saturday nights without a date, or maybe a credit-card shopping spree. When another cartoon character asks "Cathy" what she is doing for lunch, she responds, "Writing a presentation, paying my bills, having a root canal, going to the bank and picking up my cleaning!!"